Thanos Rising At Marvel NOW! 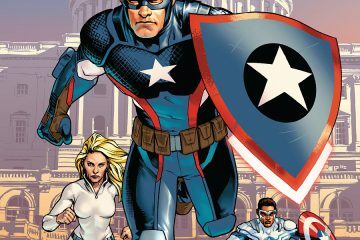 This book revolves a band of misfit heroes that probably aren’t very good at being heroes to begin with, but more times than not get the job done. We open seeing that this team hasn’t actually been a team for quite a awhile. 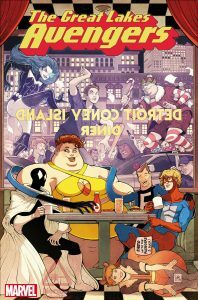 However, when the right to the name, Great Lakes Avengers, comes available again, Flatman is able to get the team legitimately reinstated. The bulk of the issue revolves around this opening act with Flatman and a lawyer, and then transitions to him getting the band back together again. This book has promise, and it is trying to be a misfit book. It wants to be quirky. The characters are cracking a lot of jokes. The book shows a lot of promise, but it doesn’t quite land in issue #1. The team is primarily made up of Flatman, Doorman, Big Bertha, and eventually we see Mr. Immortal will come more into play. This book didn’t do a lot in this introduction to endear us to these characters and that was the biggest problem. Hopefully Squirrel Girl will end up being a part of this book, because it sorely needs her. The art itself is great at times, but it can be inconsistent. Certain faces throughout look distorted in a way that can be distracting. However, on the whole it is fun to look at and the colors really pop off of the page. For someone that loves books that revolve around C and D level characters, I hope this finds its stride. The potential is there, but the opening act was a struggle. Wait and See. In ways this should be a straight pass. However, the promise and potential of a great book is here. Also, first issues in general suffer at times from having to lay the foundation, and it is easy to imagine this book hitting its stride after a couple of issues. Also, if the book was $2.99 vs. $3.99, that would make a huge difference as well.